Connect here for more issues. It is always fascinating to read critical analyses of popular films when the writer actually dislikes popular culture, which begs the question, why write about something you hate? [James Bowman writes for the journal, [The New Atlantis and his pieces are generally anti-technology and anti-pop culture. His recent article on Avatar follows the usual arguments of critics disconnected from the culture they seem bent on critiquing. Bowman describes Avatar as a flight of fantasy, dangerous because as with all fantasy films of this genre, it is both escapist and dangerously full of illusions not only about society but also about the future. Interestingly, he claims that the film doesn’t follow the Western tradition of mimesis, that is, it makes no claim to imitate reality and because of this, has no merit as art. Bowman also says that the only difference between Avatar and other films of the same type is the use of 3D as if the medium of film and its transformation is not part of an important aesthetic shift as well as an important shift in how stories are told. Bowman even criticizes James Cameron’s development of a new language for the indigenous people of Pandora, the Na’vi whom Bowman describes as monkeys. Here is what he says: "The natives of Pandora are giant blue monkeys with sophisticated fiber optics in their tails and the natural world they inhabit is filled with floating mountains, huge dragon-birds whom the inhabitants ride like horses, hammer-headed hippos the size of houses, and other fantastical creatures too numerous to mention and impossible to exist on Earth." Of course, the ‘natives’ are constructions and of course they don’t exist. As with all artifice they are the products of Cameron’s rich imagination, but in Bowman’s world imagination is actually a dirty word. But, enough about a bad review. To answer a question that must be creeping into your mind, why write about something I dislike? Avatar is an experiment in 3D, that is an experiment with images that have a rather wispy feel like the brilliant disappearing Cheshire cat in Tim Burton’s, Alice in Wonderland. 3D creates an intense feeling of pleasure in viewers largely because it is so ephemeral, not because it approximates reality. I have watched viewers try and grasp the images that come close to them. But, the closeness is itself a function of the glasses we are wearing, a function of the desire to be in the image, and to be a part of the experiences the images are generating. 3D in its modern incarnation is about generative images, that is about depth, distance and a more profound sense of perspective. 3D continues the long tradition of exploring our rather human capacity and desire to enter into worlds entirely made of images. 3D extends the Renaissance exploration of line, shape and colour. That is why Avatar is so important. Sure, its story has been told many times, but crucially not in this way. The film is an exploration of a new frontier and aside from 3D, its real innovations lie in the use of motion capture technology to create not only a synthesis of the real and imaginary, but also synthetic worlds. Finally, we can be rid of the pretensions that all art must show in the most pedantic of ways some relationship to the real!! Painters rid themselves of this crisis when they explored entire canvases of one colour (Rothko), while filmmakers and film critics still think that a black screen goes against the essence of the cinema. Of course, 3D is in its early days as a medium for exploring the power of storytelling. And, Cameron actually got much of his inspiration for Avatar from his underwater explorations of the wreck of the Titanic. Cameron is really interested in creating new languages for conventional ways of seeing and describing the world. He didn’t need to invent a new language for the Na’vi but he did. He didn’t have to shoot all those beautiful and magical scenes of Pandora, except that if you have ever swum off a reef, you would have noticed many of the same colours and shapes and why not recreate them if you can? Bowman doesn’t talk about what the word avatar means. Yet, that is at the heart of the film. Avatars are about substitution, that is about substituting what is missing, be it a body or a mind or a story. Avatars don’t replace their progenitors. That is, unless you decide like Cameron did, that his main character had to be transformed from the two dimensional world of the screen into a Na’vi, through a death and rebirth ritual that actually happens to be at the heart of what nearly all major religions in the world proselytize about on an hourly basis. Let me switch terminology for a moment and suggest that Avatar is actually a commentary on the illusions of religion and on the impossible dreams of immortality that have haunted humans since they began to paint on the walls of caves. Avatar is about that inner world, our inner world that we keep alive in order to stay alive. It is the reverse of the Platonic cave where those who are blind to reality need to be saved. Rather, the film explores those who have reconciled themselves to their fate and who have created a world that is a reflection of their weaknesses and strengths. In other words, the Na’vi are us when we dream and lest we forget, we spend a good proportion of our lives dreaming. ‘Visite à Picasso’ (1950) 20m, dir. Paul Haesaerts A poetic treatment which includes the artist painting on glass while facing the camera, shot at Picasso's home in Vallauris, accompanied by some fairly moody organ music in this very dark, but captivating film. The artist here takes on the character of an eminence-grise, an alchemist engulfed in the "sol y sombra" of his laboratory-studio, filmed in gorgeous black and white. A beautiful film about the most important election day in American History in 2008. Filmmaker, Valery Lyman describes her goals in making the film in the text below. Click the link here to view the film. It is well worth it. "I knew the feeling would be big as people went to vote for Obama, and wanted to make a real time recording of it. So I set up a phone line and asked people all over the country to call in right after they voted, saying whatever was on their minds. The idea worked. Some friends but mostly strangers, young and old, people called in from all over the country and while it all still hung in the balance, before results were tallied or anyone had the luxury of speaking in the past tense. In my work I have often sought to describe an historical moment through the faces and voices of regular people who are experiencing it. I take to the streets, recording with my camera and genuinely seeking the thoughts and feelings of these ordinary folks, and then distill this documentary material into a poetic expression of that particular historical moment. This film is such an endeavor. This film is not about Obama. Certainly it's not an advocacy or even a political film. It's about us. This film is a portrait of the feeling in the country on November 4, 2008. Regardless of what follows - whether Obama's Presidency is a failure, disappointment, or tremendous success - that day was a singular moment in American history. It is this spirit, as it was, that I have attempted to capture and preserve." This short video tells an interesting story about the special effects that are used in particular to create cityscapes for the cinema. Stargate Studios Virtual Backlot Demo from Stargate Studios on Vimeo. The novels of Ian Fleming have been around for a very long time. James Bond has been given life in so many forms and with so many different actors that is might be fair to suggest that the films (and Fleming’s novels) are among a small number of foundational stories that say a great deal about our culture and values. I will not dwell on this point. Suffice to say, that my viewing of Quantum of Solace, the latest Bond was profoundly influenced by what I have just said. The key metaphor that I want to draw from the film is the balance between fallibility and infallibility that is at the heart of Bond’s attraction as a hero. In an era characterized by the never-ending presence of terrorism, war and violence against innocent civilians, there were two moments in this film that said more to me than the entire film itself. The first came after an endless chase between Bond and a villain which led both men into an open-air arena with thousands of people attending a horse race. The villain fires his gun at Bond and hits a civilian. The film pauses for a backward glance and then returns to the chase. This raises some important questions. We witness the injured woman falling and so the film feels morally inclined to show the effects of the villain’s violence and ineptitude. But, should Bond not have stopped to help her out? Aren’t heros supposed to be capable of engineering a good outcome to everything that they do? Is the new Bond of the last few films and especially this one really a tragic hero? And, is the death of a civilian merely one part of that tragedy? The answer to these questions can be found in the ways in which justice is defined not only within the film, but within our culture as a whole. In Bond’s world (and among many contemporary movies), the roots of evil are always encapsulated within a broader context of conspiracies driven by megalomania, the desire for absolute power and greed. The overarching goal therefore has to be to destroy the source of evil even if the innocent have to suffer. The villain is more important than the injured woman and what would otherwise be a moral conundrum becomes a passing moment in an endless battle. The second characteristic of the film that is of interest to me is the way in which Bond escapes all injury during a series of spectacular encounters between himself and the seemingly endless world of evil. Every form of transportation is used to highlight his superhuman abilities and most of his encounters mirror previous challenges in previous films. The film tries to create a sense of potential weakness in his abilities and in the confidence that his boss “M” has in his character. This is all a charade of course, because he would not be Bond if he did not triumph. The ebb and flow between his weaknesses and his strengths opens up a small window for some discussion of the ethics of his violence but this too is no more than a plot vehicle. In the end, Bond triumphs notwithstanding his own lack of a moral framework for his actions. This is of course the central challenge of the war on terror, itself a metaphorically terrifying and deeply contingent way of solving issues of far greater complexity than the term ‘war’ suggests. So, it was not a surprise to me to recognize that the new Sherlock Holmes film was really a meditation on absolute power, fear of new technologies and on the role of magic and religion in determining people’s actions. Yet again, Sherlock played by Robert Downey seems to evade every form of violence directed his way. He transcends, as in the comic books, every challenge he faces including a series of dockside explosions that throw him all over the place. So, although the war on terror is very much about our general fragility and vulnerability, we have new and recycled heros who are able to withstand whatever is thrown at them. The irony is that the moral centre that is needed to progressively engage with violence has shifted as terrorists have targeted more and more civilians through their most powerful weapon, suicide bombing. Very few contemporary films deal with this issue nor do they explore the issues of inflicting pain on suspects or perpetrators. Torture is present in both films but without much fanfare and even less concern for its implications. The reality is that for better or worse, the moral fibre of contemporary culture is being challenged by events that seem even less rational (if that is possible) than just a few years ago. The challenge is how to bring this theme into the foreground of popular forms of storytelling. "Being in the air is the last refuge for those that wish to be alone." Jason Reitman) There are profound connections between Avatar and Up in the Air. Both movies come at a time that can best be described as dystopic. From Afghanistan, Iraq and other countries mired in war to the deepest and most serious recession since the 1930's, to the ongoing crisis of climate change, the first decade of the 21st Century has been characterized by waves of loss, violence and instability. What then allows any individual to compose their identity and to maintain their sense of self as the air around the planet gets thinner and thinner? How does the imagination work within a dystopia? Up in the Air explores the tropes of loneliness and travel -- the in-between of airports and hotels, those places that are not places but nevertheless retain many of the trappings of home without the same responsibilities and challenges. There are consequences to being on the road 300 days of the year and among them is the construction of an artificial universe to live in like the metal tubes we describe as airplanes. One of the other consequences is that frequent travelers have to build imaginary lives that are fundamentally disconnected from intimacy and genuine conversation. Ironically, Avatar imagines a world that is for a time dragged into the dystopia of 21st century life and where at the end of the day, a new vision is constructed. Avatar's use of 3D will be the subject of another article soon, but suffice to say that the worlds James Cameron constructs through motion capture and animation are among the most beautiful that the cinema has ever seen. Hidden behind both films is a plaintiff plea for love and genuine relationships. Avatar explores this through tales of transmigrating spirits and animistic notions that transform animals and nature itself into a vast Gaia-like system of communications and interaction. The N'avi are a synthesis of Cameron's rather superficial understanding of Aboriginal peoples, although their language is a fascinating blend created by Paul Frommer from the University of Southern California. The flesh of avatars in the film are not virtual but as the main character, Jake Sully discovers, the N'avi are the true inheritors of the planet they live on, a exotic version of early Earth called Pandora. In Greek mythology Pandora is actually derived from 'nav' and was the first woman. The Pandora myth asks the question why there is evil in the world which is a central thematic of Avatar. Up in the Air asks the same question but from the perspective of a rapacious corporation which sends its employees out to fire people for other companies or as the main character, Ryan Bingham says to save weak managers from the tasks for which they were hired. The film also asks why there is evil in the world and suggests that any escape, even the one that sees you flying all year doesn't lead to salvation. Both films explore the loss of meaning, morality and principles in worlds both real and unreal. Avatar provides the simplest solution, migrate from a humanoid body and spirit to a N'avi to discover not only who you are but how to live in the world. **Up in the Air** suggests that love will solve the dystopic only to discover that casual relationships never lead to truth and friendship. These are 21st century morality tales. Avatar is a semi-religious film of conversion not so much to truth but to the true God, who is now a mother. Up in the Air teaches Ryan that life is never complete when it is entirely an imaginary construction. It is however, the reanimation of the human body in Avatar that is the most interesting reflection of the challenges of overcoming the impact of this first decade of the 21st century. Jake Sully is able to transcend his wheelchair and become another being, now connected to a tribe. He is able to return to a period of life when innocence and naivete enable and empower — when the wonders of living can be experienced without the mediations of history and loss. This of course is also the promise of 3D technology, to reanimate images such that they reach into the spectator's body, so we can share those moments as if we have transcended the limitations of our corporeal selves. This video is about the making of Time to Pretend by Ray Tintori who is now collaborating with Spike Jonze. The video was made very cheaply and represents the convergence of low-end special effects, video editing using a computer and Youtube as a broadcast medium. Time to Pretend has had close to fourteen million hits. Jay Hoberman, the Village Voice's best reviewer and one of the top film critics in the world is one of a few who have understood and richly analysed this extraordinary film. Inglourious Basterds is not only a classic Tarantino comment upon and play with cinema history, its archetypes, conventions and clichés, it is also and quite ironically a Jewish revenge fantasy. Hoberman comments that filmmakers like Steven Speilberg exercise their will over history by mixing realism and fiction with enough balance to keep audiences believing that truth will eventually win over lies and deceit. At a minimum, Schindler's List will tell the story even if the artifice is an extreme and necessary part of building the drama. However, Tarantino revels in the contradictions of artifice and loves the multi-faceted ways in which the cinema unveils truth even as it hides it. Tarantino is at least honest about the impact of genre, style and set design upon any cinematic historical reconstruction. The opening of the film, one of the best in recent memory, celebrates not only the cinema of Sergio Leone, but also and more importantly the language of violence and the violence of language. There are always many sides to violence in the cinema. More importantly, violence is inevitably the most artificial part. Both the audience and the filmmaker know that the violence is not real. What they often do not realize is that the language surrounding that violence does more harm than the images. For example, is there any word in the English language more devalued and yet more often used than 'Nazi'? Although historically specific, it has become a metaphor for violence of all types and a trope for genocide. The smooth talking Nazis of this film use talk to hide their murderous intentions even as they are about to die. They seem cultured but are always on the edge of violence. The key Nazi character, Hans Landa (wonderfully played by Christoph Waltz) plays both criminal and detective, gunslinger and murderer. 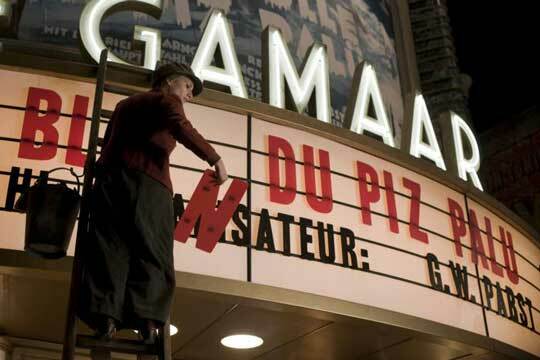 Much of the film centres on a cinema in Paris and on the showing of a film that celebrates the hundreds of people killed by a sniper who plays himself. The setting is taken from Le Dernier Metro the film by François Truffaut with further references to his later film, La Nuit Americaine. Can you name a film in which Hitler dies or is murdered? Can you remember a film in which the entire high command of the Nazis dies? The reason that so few films that deal with the Second World War allow themselves the poetic license to kill the perpetrators of the Holocaust is that for better or worse stories of victimization seem to fulfill the need to represent history in a truthful fashion. But, of course, as we know, it has been left to people like Mahmoud Ahmadinejhad to create and communicate their fictional universes. Ahmadinejhad and the Protocols of the Elders of Zion are perhaps the best example of how fiction can be made into truth with a variety of effects that can actually change history itself. Everyone knows that the Protocols are a lie, but that has not prevented their continuous dissemination since the early part of the 20th Century and their most recent appearance on Egyptian television. Tarantino knows all of this and has created a film that reflects in a serious manner on what would have happened if Western culture had recreated the many stories of the war in a different manner. And, he also understands that representations of the war need to reference the genres they use, otherwise they actually reinforce the picture of oppression as inevitable. The film is as much an exploration of loyalty and betrayal as it is a brilliant piece of research into the underlying premises for nearly every war movie that has ever been made. Add to this, a further exploration of the Western genre as the prototypical example of how Americans view their own history and one realizes that Tarantino has created precisely the story we need to see. In the end, it is a Jewish woman (the only survivor of her family's murder) and a black man who willingly sacrifice their lives to kill the German high command. David Edelstein has an interesting review here from New York Magazine. A very negative review by Liel Liebovtiz can be read here. There has been a great deal of discussion recently about the many new ways in which aspiring cultural creators can find audiences and also make a living in in the notoriously challenging fields of film and television. "Here is the new way: filmmakers doing it themselves — paying for their own distribution, marketing films through social networking sites and Twitter blasts, putting their work up free on the Web to build a reputation, cozying up to concierges at luxury hotels in film festival cities to get them to whisper into the right ears." Michael Cieply The animation film KHODA by Reza Dolatabadi, below is an excellent example of this new approach to creation and distribution. Pause this film and you will see a painting. This idea inspired Reza Dolatabadi to make Khoda. Over 6000 paintings were painstakingly produced during two years to create a five minute film. 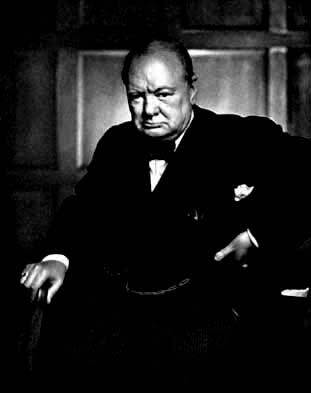 The most famous portrait of Winston Churchill. This is an image found on the Internet. What does it mean to say that? RAW VIDEO: NASA has released newly restored video from the live television broadcast of the Apollo 11 moonwalk. Screen Media Arts by Hart Cohen, Juan Salazar and Iqbal Barkat is a superb book designed to be used in introductory and advanced university classes that study both traditional and digital media. The book comes with a DVD which adds not only resources to the book, but moves the book beyond the conventional boundaries of text and paper. The Australian Publishers Association has short listed the book for a major award. The book examines areas like the relationships among photographs, images and the transformation of images into data and information. The range is broad, from Roland Barthes to Marshall McLuhan to animation, documentary cinema, narrative cinema with an excellent chapter on experimental film; in each instance there is depth and intellectual rigour. For example, Chapter Two, which deals with Narrative Forms and Screen Media Arts, introduces the typology of Valdimir Propp alongside a discussion of the linguist Roman Jakobson and the anthropologist, Claude Levi-Strauss. The interconnections here are important and often not recognized by modern day scholars in film. The efforts in the 1970's to develop a semiotics of the cinema, led in large measure by the research and writings of Christian Metz, were profoundly influenced by linguistics. [Jakobson](http://en.wikipedia.org/wiki/Roman_Jakobson), whose work was in phonetics, was very interested in typologies because systems of classification make it possible to describe complex systems in a fundamentally simple way. Levi-Strauss was deeply influenced by this, and his early work builds on Jakobson's insights. Metz tries to redefine the relationships between language and film and searches for a systemic way of explaining how meaning comes to be organized in specific patterns, particularly in narrative film. However, he doesn’t adequately define the nature of the filmic system and ends up suggesting the presence of grammar-like processes that determine film’s signifying properties. Chapter Two grapples with these issues and includes a number of questions that should push students to investigate this important history in much greater detail. One of the key claims in the book is that 'digitisation' expands the potential for story-telling in the cinema. Although I agree that interactive tools and virtual worlds have had a transformative effect on the nature of images, I am not altogether sure that audience participation also transforms the rules of narrative. The best place to examine this claim would be through a systematic examination of YouTube which is referenced in the book more as a resource than as an object of study. Chapter 16, which deals with Social Media, engages with the plethora of media but creates an inventory rather than connecting social media more fully and richly to questions of narrative. At the same time, Chapter Four, which is one of the best chapters in the book, engages in a profound manner with the shifting space of audience concerns and interests. Part Two, which is made up of five chapters, deals with a variety of technical issues around production, legal constraints in filmmaking, directing and editing. These chapters will be useful for practitioners. Editing is seen through the theories of Sergei Eisenstein. The notion that the combination of a number of shots (sometimes just two) will produce an “idea” is based on Eisenstein’s overall premise that a universal visual competence governs the ways in which pictorial languages are understood and also the ways in which the specific properties of communication of a given shot are created, recognized and perceived. This fits in with Eisenstein’s emphasis which is drawn in a mechanical way from behavioural ([Pavlovian](http://en.wikipedia.org/wiki/Ivan_Pavlov)) psychology. The Chapter on editing needed to examine this debate in greater detail and relate its presumptions back to the earlier chapters on narrative. The last chapter of the book explores the present and future in screen media and has some excellent examples of media that are pushing the accepted boundaries both at the level of production and with respect to narrative structures and orientation. Screen Media Arts stands out among the vast number of introductory texts available on the market! Take a look at this wonderful short film about the making of Coraline. The detailed worlds created by the filmmakers and the use of stop motion transform this into one of the most unique animations ever made. Some extracts from my second book. The complete book can be ordered here. UP the new 3D animation from Pixar is at one and the same time a simple and beautiful love story and an exploration of the medium of animation. 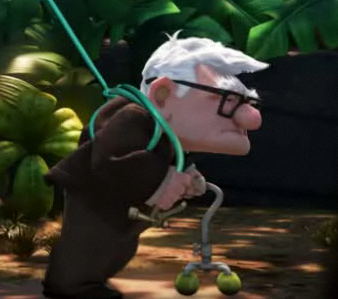 3D is used here not as an effect but as an enhancement, a way of transforming the artifice and artificiality of animation into a narrative of an old man's love of his deceased wife. The old man struggles with modernity, with change and with urbanization. His search for a lost Eden is really a search for his lost childhood. In fact the film is about the symbols and objects that make up and give meaning to life at any age. Well worth a visit to the theater. There is an empty space between Georges Bataille’s Story of the Eye (which invests every look with fantasy and converts every fantasy into a series of images) and the technological determinism of László Moholy-Nagy (a member of the Russian constructivist movement of the 1920’s): “Photography, then, imparts a heightened, or [in so far as our eyes are concerned] increased, power of sight in terms of time and space. A plain, matter-of-fact enumeration of the specific photographic elements — purely technical, not artistic, elements — will be enough to enable us to divine the power latent in them, and prognosticate to what they lead.” Richard Kostelanetz, ed., Moholy-Nagy (New York: Praeger, 1970) 52. The quote above must be understood as one of the key assumptions in the description of photography as a medium, the melding of scientific and aesthetic concerns around ideas of representation, the attempted fusion of technology and the eye. Moholy-Nagy anticipated the pivotal role of photography in generating scopic regimes which would validate cultural presumptions of truth. He could not have anticipated the way photography would evolve as a distinctive marker for temporal shifts, as an integral and strategic respondant and creator of historical discourses. Yet, he would have been aware that he was in fact creating a context for the photographic image which locates its truth value in the power of its reproductive aesthetic and its instrumental role. And he would have known that he was following the Cartesian imperative to rid the world of its optical illusions, to find truth in the visible and to make the visible truthful. For Moholy-Nagy, the mental, the physical and the real gain their strength from the image. The image becomes that schematic point of reference which allows technology to transcend the inconsistencies and weaknesses of the human eye. His was as much a technical as a pedagogical imperative. The aim was to use the image to teach some basic truths about the human condition, to strip away those categories of seeing which the “eye” of everyday life imposes on human subjectivity. In positing such a direct link between knowing and seeing, Moholy-Nagy makes use of a model of mind which enframes knowledge as visual and which constructs the mind as a mirror of the world around it. That model continues to resonate with some power in present day discussions of images, particularly with respect to the role of images in the media. Joel Snyder dissects the ideology which underpins this conception of the image in “Picturing Vision,” The Language of Images ed. W.J.T. Mitchell (Chicago: University of Chicago Press, 1980) 219-246. “Adoration,” the new film by Atom Egoyan is a profound and extended exploration of language and memory through the eyes of a young teenager. In particular, the film tries to understand what happens to a child who cannot comprehend the death of his parents other than through the fragments and ellipses of conversations and comments by relatives and friends. This is a deeply psychoanalytic film. It is psychoanalytic not because as some critics have suggested it is a coming of age film. Rather, each character has to come to terms with their own role dealing with trauma both within their families and as observers. The psychoanalyst is the viewer who has to delve into the contradictory narratives that the characters use to justify their state of mind and relations with each other. But, viewers cannot solve the issues, cannot intervene and must struggle on their own with the implications of losing control over the evolution of the story. In some senses, this mirrors the challenges of the main characters. They cannot exert control over their memories or even put those memories into some kind of clear order. It takes an outsider, in this case Sabine a teacher to reestablish some sense of direction for the family. As R.D. Laing once put it, the problem with families is that everyone has a different point of view of the same experiences, and each person feels that their point of view is the correct one. As a result, families are always in conflict with the memories that they share. In this case, the child has no memory of his parent’s death other than through the metaphors given to him by his Uncle and his grandfather. The latter blames Simon’s father, Sami for killing his daughter. What is a child to make of this? The idealizations of memory clash with the realities of a world infected by violence, much of it arbitrary. What if the death of his parents was the result of a terrorist act? Is it preferable to believe that his mother died because of a momentary mistake or because someone perpetrated an act of terror? How does a child interpret the trauma of events like September 11th in the context of personal experiences? How do impersonal events become personal? And what role does the Internet play in opening up the personal struggles of a teenager to the discourses of strangers? As Simon delves into what turns out to be a true story about a terrorist who sends his pregnant wife on a plane with a bomb designed to destroy it, he learns through the comments of friends and others, that death by whatever means is never romantic. He learns that each person has his or her own history. He discovers the paradoxes of personal discourses, intertwined with myths and illusions and this enables him to make sense of his own history. It is within this context that Atom Egoyan explores the complex terrain of the conflicts in the Middle East. The death of a couple in a car crash is elevated into a cultural clash. The film tests the boundaries of what can and cannot be said about the conflicts between different ethnic groups bound to ideologies that they often don’t understand. This too is about history and memory. How does hatred develop and why? Simon’s grandfather expresses the classic prejudices of someone who neither understands what he is saying nor the general implications of his words most of which inevitably lead to violence. His violence is discursive. Words matter and more often than not they are used to hurt those whom we do not understand. Language is this rich space, this fundamental tool of communications that we as a culture have developed and also perverted. It doesn’t matter if it is the Internet or a family supper, what we say and how we say it affects not only how we perceive the world but also how we act within it. Simon creates a story encouraged by Sabine his teacher that slowly takes on a life of its own. He uses the story to channel his confusion about his parent’s death into a convenient narrative that quite ironically fits into a preconceived cultural pattern in which the accidents of life have to be framed by some sort of rationale. As Simon learns that the value of life lies beyond the trauma of his parent’s death, he decides to purge his grandfather’s influence on him by burning something that was of great value to his grandfather. Simon also burns the Nokia cell phone that he had been using to film a series of interviews with his grandfather before his death. This is one of the most powerful scenes in the film. The cell phone slowly melts, the images on it pixelate, and Simon’s memories are channeled to a new level. In one of his best books, “We Have Never Been Modern,” Bruno Latour explains that even though time moves forward, history is not so much about the past, as it is about the many ways in which the past and the present always converge. “Adoration” explores this seemingly endless clash between the past, our interpretation of it, and the implications of not putting a personal stamp on the ways in which we interpret our own histories. Truth is the crucial arbiter here. How do we gain access to the truth? Is it through images? Is it through the Internet? Is it through the eyes of a child? Where are the boundaries between innocence and insight? In the final analysis history can never be reversed. The events of the past such as the death of Simon’s parents cannot be undone. This is the source of endless trauma and unless we can manage it, the trauma takes over not only our daily lives, not only our fantasies but also becomes the very basis upon which we interact with our families and friends. Much of what we learn in childhood is channeled through the words of our parents and relatives. Many of our memories are the memories of others. The transformation of memory into a discourse we can control is the thematic core of Egoyan’s film. “Adoration” is a masterful story of how this process of transformation and regaining control changes Simon, but it is also an important statement about the bridges that have to be built between childhood and adulthood. Throughout the film there is one constant that unites everyone and it is the violin that his mother played. The acoustics of the violin are like the human voice. In a scene that unites the narrative, (and which we see twice), Simon’s mother stands at the edge of a pier playing a beautiful piece. In the first instance the witness is Simon as a teenager. In the second, it is Simon with his father on the fateful day of his mother’s death. Both instances clash and unite with each other. Time is conflated. All that is left is the plaintiff cry of the violin. Music is always about the evocation of memories. Two PDF's from the distant past. In 1967, Take One Film Magazine published some interesting and important articles on the cinema. It was an independent magazine, one of the few in Canada at the time to take film seriously as an object of study and criticism. I reviewed the Andy Warhol film, Chelsea Girls after a trip to New York. The PDF Download file is available here. In 1985, I published a piece on the relationship between images, dot-matrix printing and computer technologies. The PDF Download file is available here. This article is in French and was original published in the Journal, Copie Zero. The Class directed by Laurent Cantet won the Palme D'Or at Cannes and is in the running for best Foreign Film at the Oscars in 2009. Since I consider this to be one of the worst films I have ever seen, and since it has received a 94 rating on Metacritic, I feel impelled to explain my very negative reaction to the film. Aside from the endless stereotyping, the poor acting, the 'faux' realism, the impoverished use of the camera, the sheer banality of the setting, and the lack of insight about learning and education, why does this film fail so miserably? First, there is the hubris of the writer of the film, François Bégaudeau (based on his book) also insisting that he be the main actor. This leads to the rather ironic situation of an actor who cannot act supposedly adding realism to the setting because realism, in the eyes of Cantet is obviously premised on amateurism. The more amateur, the more likely the characters will be believed. It is clear that he has learned nothing from the last decade of 'reality' TV. It is also clear that neither Bégaudeau nor Cantet have ever watched any of the films and television shows that have come out over the last twenty-five years that have as their central theme, the classroom and by extension the educational experience. Many of the young actors in this film are so poorly directed that they reveal the sheer artifice of the script with nearly every word that they say. Second, Cantet, obviously decided that a moving camera was the best way to shoot for realism. So, the camera jumps around like news broadcasts do and like MTV used to with music videos from 1985-1995. This style, now a cliché offers nothing of substance to the thematics of the film. What are those thematics? French society is now diverse. Their educational system is made up of well-meaning teachers who have yet to come to grips with the challenges of multiculturalism. Black students from Mali like soccer. Moroccan students like their national team. Some girls are aggressive for no apparent reason and others are intelligent but not in the right way. Oh yes, one of the black students shoots some photographs and momentarily becomes a hero before he is thrown out for undisciplined behaviour. There are many shots of the heroic Bégaudeau playing teacher against increasingly difficult odds in a series of lengthy sequences that are notable for their sheer lack of insight into the characters let alone the teacher. There are the usual ill-informed comments about gay people accompanied by laughter on the part of the students that makes them seem to be idiots which is by the way, the outcome of the film. At the end, the students are just not capable of really learning except for a few naturally gifted ones. There is the usual, conventional stereotype of the Chinese student who against all the odds actually applies himself and is able to answer the 'difficult' questions posed by the teacher. The banality is heightened to perhaps its greatest level of superficiality by the depiction of the school Principal who could have walked out of 50 films of the last two decades, some even from France. What happened here? Well, this film is the cutting edge of a major crisis in the cinema. Perhaps the filmmakers and the writer don't watch much contemporary film and television. Perhaps, they were self-consciously engaging in depicting banality by reproducing it. Perhaps they were critiquing that banality. Even if I were to grant them that latitude, the film has very little to say. The crisis is in this false conception that realism is derived from and dependent upon truth. Neither documentaries nor fiction films can ever escape the conundrums of realism versus narrative. From a structural point of view, both genres share many different elements which is why a Clint Eastwood film on Iwo Jima can end up being more 'realistic' than many documentaries. This is not the place to enter in this lengthy and historically important debate. Suffice to say, that Cantet seems to be uninterested in exploring either the medium he is using, the story he is telling or the audiences he is addressing. This is the result of an aversion to history, theory and creative engagement. Mark Olson wrote the following in the LA Times last December: "In focusing on a single class, filled with kids from a variety of ethnic backgrounds, captured with a documentary immediacy, the film finds a snapping, pinging rhythm to present the classroom sequences, a seesaw balance between creative chaos and genuine disorder. Perhaps never before has a film been able to wring such drama from diagramming sentences and discussing the fine points of proper verb tenses." I would challenge the readers of this web site to make a list of all the films that you have seen over the years that deals with the classroom experience. Olson can only say this because he has not examined that history. Cantet in one of many interviews claims that the film reflects the diversity of France. It does reflect precisely the superficial stereotypes of ethnic diversity with nary a moment of insight into the families we encounter through their children. This sad reductive film makes almost no use of the student actors who could have, by virtue of their own lives recounted some things of great interest to us all. I would suggest that Cantet and his crew and his writer watch "High School" by Frederick Wiseman, a film that struggles to find not one, but many voices in the maelstrom of the learning process in school. The film was made 41 years ago. Needless to say I have a very different take on La classe. Despite what you perceive as the endless stereotyping, the poor acting, the faux realism, the impoverished use of the camera, the sheer banality of the setting, and the lack of insight about learning and education, I saw in the film vestiges of my own experience as a high school student in Quebec. While I was growing up in the sixties in Quebec, the Catholic Church controlled education. However, in so many ways the presence of France loomed larger than the Church. This came through in obvious ways such as in textbooks, or examples given to understand the world such as the land mass of France fits twenty times in the land mass of Quebec (something that I have never forgotten), and other such esoteric facts. And then there were numerous but perhaps more subtle ways that France as a superior country loomed as the subtext of education in Quebec at that time. For me one of the most poignant moments in the film is when the teacher tries to teach Rimbaud which was clearly intended to highlight the gap between him and the students. The gap was not only because Rimbaud holds such an influence on French literature and art but because he represents a certain idea of education which fails to take in to account the value and richness of the student's experience.